Today I bring you a failproof, quick chocolate birthday cake and a bit of backstory. Just to get you salivating, it looks like this, but don’t worry you haven’t missed it, my birthday was ages ago. After a few weeks of sailing through writing these little legacies I came unstuck this week. People say the first year of a bereavement is about getting through all the firsts, and there were two big ones this month, Miss L starting school and her 5th birthday. A few people have had me thinking about my inner child this week, Dichotomy of wrote an amazing post about her son being 8 alongside her 8 year old inner self. Marketing to Milk wrote about being a 30-something orphan. I was also chatting to Sandra from Thinking Slimmer, the amazing weight loss podcast I am successfully trialling, which got me thinking how powerful the inner child can be. So recently the 5yo child, the 34yo adult, and the mother in me, have all being trying to grieve with rather confusing results at times. The 5yo in me likes to self sabotage any rational chance of the grown up moving through this easily. Prompted by also having a 2yo, there is probably a 2yo me grieving too, clinging and throwing tantrums. And so perhaps it will go on, as my children grow up, although with each month that passes the adult me has a stronger grip on things. How did I appease these inner children this time? With my mum’s failproof birthday chocolate cake. As I made it for Miss L’s birthday I felt my mother’s voice, just as I did last week with the sewing, the guidance through motherhood I so desperately miss, reminding me how to make it. It really hit me, as I asked on Twitter how to get jelly out of a mould, that I miss having mum to ask. Organising kid’s parties is a huge challenge and I kept wanting to ask her advice. Fittingly Jen from Mum at the Madhouse came to my aid. You don’t grease a jelly mould by the way, you stick it in boiling water before turning out. So for the 5yo me and for Miss L, there was a chocolate cake, and for the mum in me, a recipe that no adult can fail to make amazing. I nearly made the icing with chocolate and double cream, but mum’s recipe is much quicker, easier, tastier, lower fat and a fraction of the cost. It’s in old measurements, because all mum’s recipes are, bound in a ring binder she gave me on leaving home at 18. There’s even a recipe for playdough in there, she really was thinking ahead, my amazing mother. The 5yo me has done enough sabotage for one week though, I am back on eating with moderation this week. 3 Place 4oz of wholemeal flour, 4oz soft light brown sugar, 4oz marg, 2 eggs, I tbsp cocoa 1.5 tsp baking powder in a bowl and whisk/beat together. 5 Divide between tins and bake 25-30 mins until firm to the touch/springy and cake shrinks from side of tin. I would sandwich this with Jam – as my English teacher used to say when talking about using descriptive language, you don’t want a chocolate cake that is all chocolate it just makes you feel sick – but I would use this chocolate icing on top. 1 Melt 1oz cocoa and 11/2 oz of margarine in a pan, don’t let it boil. 3 Remove from heat and beat in icing sugar. 4 Use quickly. 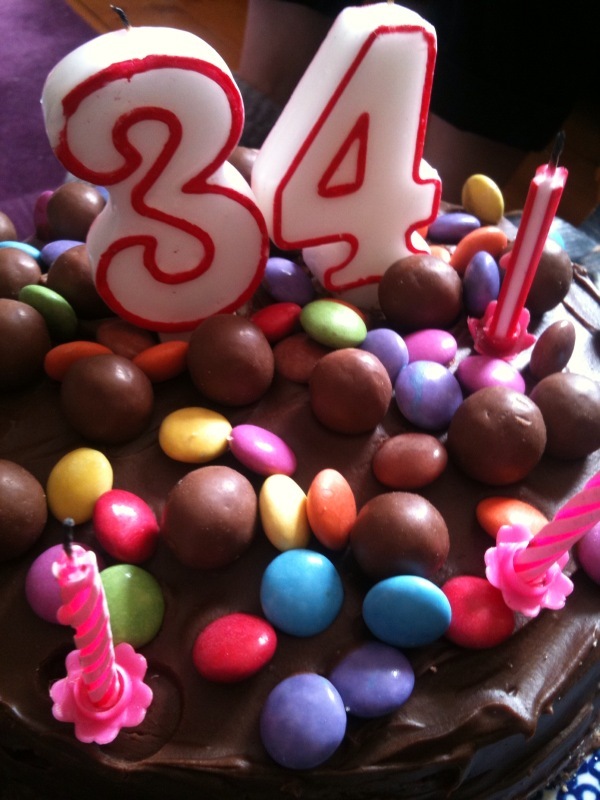 I cover the cake in Maltesers and Smarties. Do you have a favourite, fail safe family recipe? Would love to hear it. Or any other legacy that’s popped into your mind this week. Link up a post, or leave a comment.